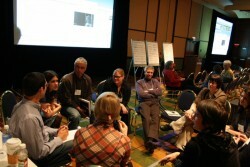 Immediately following the Unconference Pitches, self-selected groups will move to breakout areas for discussion. You'll have a good chunk of time to get your teeth into a question. Then there's plenty of time to continue the conversation in a reception in the Exhibit Hall.